“Spooky! What a strange feeling I experienced on seeing the title to Vivien Hampshire’s article about including sound in our fiction: ‘Sounds Good’ (WN p32, Jan 2009). “That was the very title I used for my short story in the recent Mace&Jones ‘justice’ competition. While I appeared in the Top Ten, I didn't get a mention or prize, but I can console myself with the knowledge that the story has been accepted for a monthly magazine here in Spain. “The main character is Leon Cazador – Lion Hunter in English translation – who is half-English, half-Spanish and is a latter-day Simon Templar character. ‘Sounds Good’ will be his twentieth published outing and I eventually hope to collect the stories for a book. Yesterday I wrote 138 words for BLIND JUSTICE and tweaked the first chapter as a result of helpful comments from the Writers' Circle. I also managed 449 words for THE DRAGON TREE. The latter is shaping up well, the characters and events evolving towards a confrontation. Of course the number of words typed is not always a good gauge of progress. Often, the story is writing itself - with the help of assorted characters - in the back of my head. Contrived and trite happenings are discarded for more believable or logical alternatives as the characters work through their situations. Then a few typed words on the plotline and at some point later when the writing resumes, the flow of words becomes a torrent because it's all there. Also I have been writing or sorting out material for the Writers' Circle. This can write off a day's creative writing. As Rob humorously observes in an earlier comment, while life may get in the way of creative writing, it's preferable to the alternative! Living life, sharing its trials and tribulations with friends and family may help the writer become a better scribe. Our daughter's car is causing problems - as is their garage - so that little issue takes precedence over writing, as it should. Then we're babysitting Darius three days a week, which will be an experience to be cherished - as the cliche says, they grow up fast. Yesterday I managed about 2,900 words on THE DRAGON TREE, the tentative title for my romantic thriller set in Tenerife. When I'm following the plot and get engaged with the characters, the words flow. Previous days I've barely written 600 words per day, though often that's because of other distractions, like life. Judging by the wordcount, I think I'm about halfway through. The characters are defined, described and I have backstories for the major people involved. Yet they still tend to surprise me as the story progresses. I have an ending more or less lined up but I suspect that the characters and the situation they fall into may dictate some startling changes! 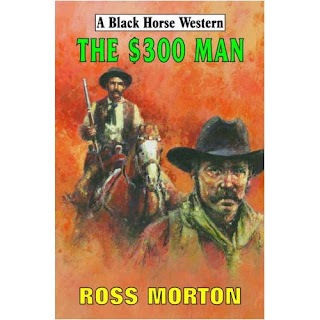 Just been asked and agreed to be the editor of the next western anthology from the Black Horse Westerns yahoo group of writers. 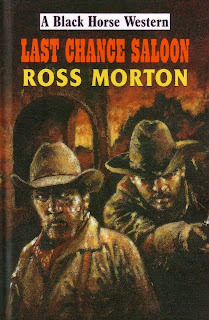 A paperback imprint was established - EXPRESS WESTERNS and the books are printed through Lulu.com. In 2007 the first book - WHERE LEGENDS RIDE - was published and was very well received. The principle editor was Matthew P Mayo, then living in Maine but since moved to Montana. I was co-editor. The publisher was - and is - Ian Parnham. Matthew's wife Jennifer designed the cover using my pony express rider logo. The rights to the painting are owned by David Whitehead who also wrote the introduction. 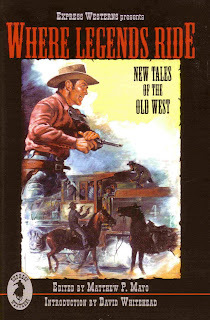 The group comprises readers and writers of Robert Hale westerns under their imprint Black Horse Westerns. So I'm looking forward to this project. Contributors will come from far afield - Spain, USA, New Zealand, Japan and a few other places besides! Iran, 1978-1979. Tana doesn’t hesitate to kill evil men. Iran is in ferment. The British Secret Intelligence Service want Tana’s assessment because the CIA agents are painting too rosy a picture. Because they’re colluding with the state torturers? Allegiances and loyalties are strained as Tana saves a CIA agent’s life and combats the sinister secret police, SAVAK. Is there any threat to the MI6 listening post near the Afghan border? And what about Yakunin, the psychic Russian who is tracking Tana? Can he save her without being discovered? Or will he be betrayed by the jealous Raisa? Then there’s Aksakov, an elite Spetsnaz fighter assigned to abduct Tana; her dedication takes Aksakov into the heart of Tana’s secret headquarters in Oxfordshire. Tana makes new friends - and new enemies - as Iran stumbles towards the Islamic Revolution. 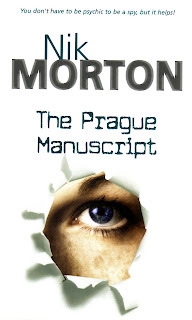 A Libros International paperback - to be published 2009. I received acceptance of this manuscript on my birthday last year (2008). It was a great birthday present! What’s a life worth? $300, maybe. Half-Mexican Corbin Molina lost a hand during the Civil War but he has adapted. Now he’s on a mission to Walkerville. On the way, he prevents a train robbery and finds an old friend. Corbin always carries $300, which is significant, since that’s what he was a paid as substitute soldier for the Union. When Corbin starts asking questions about Walkerville’s law and administration, he discovers that the Walker family, who seem to have bought and paid for loyalty and position, dominates the townspeople. Inevitably, Corbin’s questions attract plenty of trouble. And his past emerges to confront him during a tense showdown that threatens not only him but also his newfound love. Czechoslovakia, 1975. Tana is a spy - and she's psychic. Orphaned in the Warsaw ghetto during the Second World War, she was adopted by a British naval officer and his wife. Now she works for the British Secret Intelligence Service. Czechoslovakia's people are still kicking against the Soviet invasion. Tana was called in to restore morale and repair the underground network. But there's a traitor at work. And she learns about a secret Soviet complex, concealed in a colliery in the Sumava Mountains. Unknown to her there's a top-secret psychic establishment in Kazakhstan, where Yakunin, one of their gifted psychics, has detected her presence in Prague. As he gets to know her, his loyalties are strained. With her old flame Laco, Tana infiltrates the Sumava complex. When she's captured, a desperate mission is mounted to either get her out or to silence her - before she breaks under interrogation. Before taking her vows, Sister Rose was Maggie Weaver, a Newcastle policewoman who suffered severe trauma while uncovering a serial killer. Nursed back to health by nuns, she joins their Order. In her new calling she finds herself sent to London to run a hostel for the homeless. Here, while doing good works, she combats prejudice and crime. 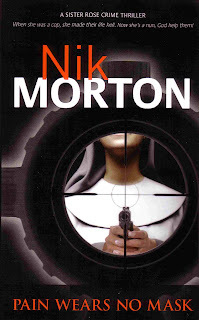 As Sister Rose attempts to save a homeless woman from a local gang boss, events crystallize, taking her back to Newcastle, the scene of her nightmares, to play out the final confrontation against drug traffickers, murderers and old enemies in the police. She finds her spiritual self and a new identity. She is healed through faith and forgiveness. This is also about her surviving trauma and grief, a triumph of the human spirit, of good over evil. The Bethesda Falls stage is robbed and Ruth Monroe, the stage depot owner, is being coerced into selling up by local tycoon, Zachary Smith. Daniel McAlister returns from gold prospecting to wed Virginia, the saloon’s wheel of fortune operator. He hits a winning streak but is bushwhacked, his winnings stolen. And newcomer to town, Horace Q Marcy, seems to be playing a game close to his chest, too. Virginia sees this romance with Daniel as her last chance of happiness. No matter what, she’s determined to stand by her man, ducking flying bullets if need be. Daniel and Virginia side with Ruth against Smith and his hired gunslingers. Only a deadly showdown will end it, one way or another. A Robert Hale Black Horse Western. It was a great feeling to hold this attractive hardback in my hands. After many years of sending off MSS, I'd finally become a published author. Not self-published - I've been there and done that too many years ago - but a fully paid up author. Jim Thorp had killed plenty of men. They deserved to die. Thorp was a hard man, made so by a bloody Civil War. But he didn’t relish this visit to Bethesda Falls. His old sweetheart Anna worked there as a school-teacher and he was hunting her brother, Clyde, for armed robbery and other more terrible crimes. He didn’t want to hurt Anna but it looked like he would anyway. Clyde, the foreman of the M-bar-W ranch, is due to wed Ellen, the rancher’s daughter. He’s also poisoning the old man to hasten the inheritance. Thorp’s presence in town starts the downward slide to violence, when not only is Ellen’s life in danger, but also that of Anna and Thorp himself. It is destined to end in violence and death. Robert Hale is a good publisher to write for, as they're prompt in their response times. 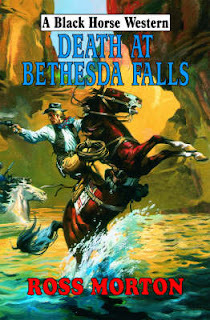 DEATH AT BETHESDA FALLS is now out of print but a large print version has been issued by Linford. BLIND JUSTICE - my fourth western novel. Only just begun, partially plotted. THE DRAGON TREE - a full-length romantic thriller set in Tenerife - halfway through. Fully plotted. SNEEZE ON A THURSDAY - a full length novel aimed at Hard Case Crime. The first in a private eye series set in Charleston, South Carolina featuring Pete Axiom and his secretary Verity Honradez. Started, still plotting. THE KHYBER CHRONICLE - third full-length thriller in the psychic spy Tana Standish series for Libros International. Sequel to the forthcoming THE TEHRAN TRANSMISSION. Plotted and begun. SILENCED IN DARKNESS - the second full-length crime thriller about Sister Rose for Libros International. Still in the plotting stage. Hunter Hunted - 21st short story in the series about Leon Cazador, the half-English, half-Spanish private eye on the Costas.